The Aruba 3810 Switch Series provides performance and resiliency for the mobile-first campus network. 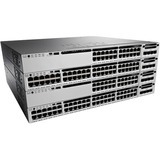 Based on a powerful ProVision ASIC and ready for high-speed APs with HPE Smart Rate multi-gigabit Ethernet, the Aruba 3810 delivers a better application experience with low latency, virtualization with resilient stacking technology, and line rate 40GbE for plenty of back haul capacity. 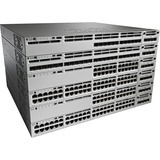 The Aruba 3810 has comprehensive Layer 3 features, right size deployment models, and is SDN ready with OpenFlow support. The Aruba 3810 Switch Series is an industry leading mobile campus access solution for enterprises, SMBs, and branch office networks. With HPE Smart Rate multi-gigabit ports for high speed 802.11ac devices, the Aruba 3810 will prepare your network for tomorrow. HPE Smart Rate ports support multi-gigabit Ethernet speeds (1, 2.5, 5, and 10 gigabit Ethernet) on existing cabling for cost-effective and convenient network upgrades with no rip and replace of cabling. Delivers consistent wired and wireless user experience by supporting unified management tools such as ClearPass Policy Manager and AirWave Network Management. Provides optimal configuration automatically when connected to Aruba APs for PoE priority, VLAN configuration, and rogue AP containment. 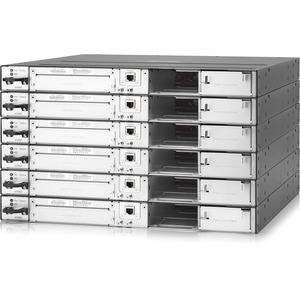 Rightsizes deployment and back haul capacity with modular 10GbE and 40GbE uplinks. Full PoE+ provisioning on 48-ports. Dual, redundant, hot-swappable power supplies and innovative backplane stacking technology delivers resiliency and scalability in a convenient 1U form factor. Advanced Layer 2 and 3 feature set with OSPF, IPv6, IPv4 BGP, robust QoS and policy-based routing are included with no software licensing. With support for OpenFlow, the Aruba 3810 is ready to take advantage of SDN applications such as HPE Network Visualizer, Optimizer, and Protector Applications.